The eastern popularity of Cardamom as a sweetly fragrant and flavorful spice is still going strong today. Loved for its sweetly tempting aroma as much as its medicinal benefits as a digestive aid and breath freshener, cardamom is often found in homes across South East Asia. 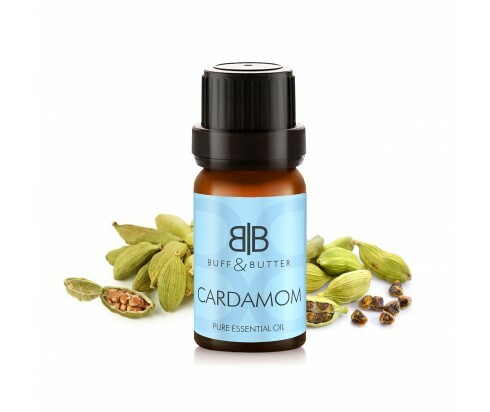 Cardamom oil helps boost metabolism, stimulating the entire system in the body and the digestive system in particular, with the secretion of gastric juices, acids and bile in the stomach. Its warming effect helps clear congestion and common colds, and treat diarrhea caused by cold. Antiseptic and antimicrobial properties in the oil make it great to disinfect oral cavities – dilute a few drops in water and use as a mouthwash to get rid of bad breath. Cardamom oil helps increase urination which has a range of benefits including removing toxins and lowering blood pressure. This oil is also helpful for relieving muscular and respiratory spasms, including muscle cramps.